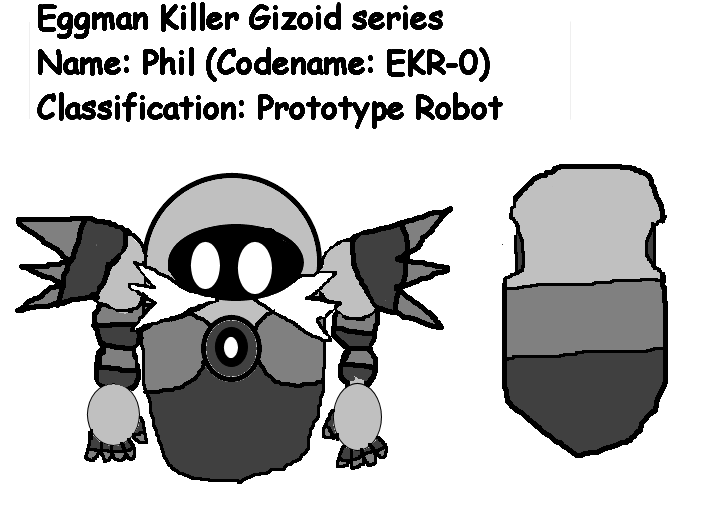 This is Zhen's best friend; a gizoid that was codenamed "EKG-0". He was once a failed prototype, but while Zhen was prisoner, she found him using her new powers, and used her power, to turn him into a living being, and, after getting the name of "Phil", he became her companion AND best friend, ever sense! While Phil isn't invincible, or all-powerful, he is in fact, a gizoid, but with stable software, that led him into his own life and free will. Plus, while he's easy-going, and while he does have some respect for Eggman, (due to the fact, that he created him) Phil went on his own free will, as Zhen's best friend and companion.